A call to Jan Jaap Minnema at Fraser Yachts brings the news that his central listing, the 34.7m motor yacht My Issue II, has been sold with Nakhimov in Monaco acting for the buyer. Jan Jaap comments, "She went for a good price, proving that quality always sells." 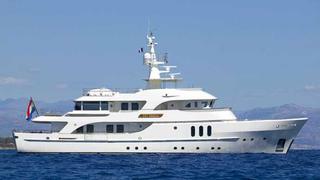 My Issue II was built by Moonen in 2006 to Lloyds class and is an explorer yacht with an ice strengthened hull. This superyacht's interior, designed by Rene Van Der Velden, accommodates up to 12 guests in a master, two double and two twin cabins along with two Pullman berths. She has a cruising speed of 11 knots and a range of 4,500 nautical miles at 10 knots. MCA compliant, My Issue II was asking €12.5 million.